Archaeological research relies on sharp close-up photographs to document and illustrate observations on artifacts. I was very fortunate to have been hired by the Ban Chiang Project, for my work study position this past year, and be able to use my professional skills in photography for the fascinating assignment of making detailed photographs of their ceramics. The pottery collection Penn archaeologists excavated in Thailand during the 1970s is slated for publication in an upcoming monograph, and the volume needs this careful visual documentation. Photographs that show how the pots were made are a top priority, and I had to develop my skills in macro-photography with shallow-depth-of-field and high contrast lighting to bring out the important details. 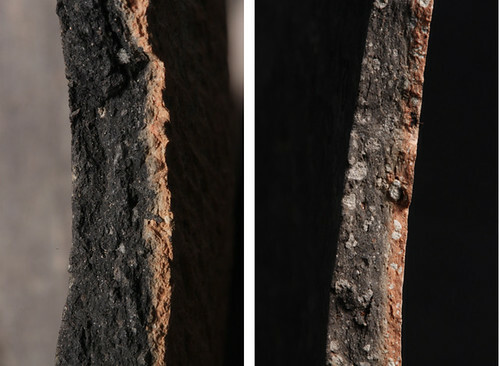 Above: Photographs of fresh breaks in the ceramics show evidence of firing practices and clay preparation. We can see some of the coarser inclusions added to the clay by the potters. For me the most interesting thing about photographing the ceramics collection is the diversity of skill by the potters. The pots that are not completely finished, smoothed, or made by skilled craftsmen tend to be the most fun to photograph because they really tell a story. Instead of covering up the history of the pot, the little flaws remain a sculptural record of how the pots were made. Every imperfection is not just a visual hiccup but instead a possible lead to unravel techniques and technologies used in fabrication. Many times, I find that my favorite pots to photograph are the least “photogenic” on the whole. However, up-close with the macro lens these pots reveal a totally different world. 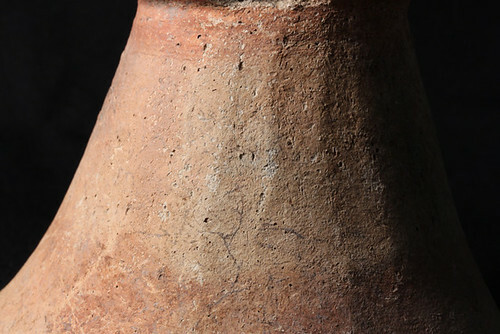 Above: We look at not only the shape of the pot but also the quality of the painted and incised decoration. Was the pot on the left decorated by an apprentice? Sometimes poorly skilled decoration is put on well-formed pots, showing that perhaps multiple people worked on each pot as part of the learning process. In contrast, other pots like the one on the right show a high level of meticulous craftsmanship in their decoration. Photographing these subtle details with the macro lens is surprisingly difficult. Sometimes the features are very obvious because they have not been smudged, smoothed, or covered up. However, the majority of the time the details are very subtle, and Dr. Marie-Claude Boileau and I have to search to find them. Once we have identified the features that need to be photographed, I work changing the light very dramatically as I photograph them. With the use of both studio lights and a ring-flash, I can bring these details out and put them on display for the camera in a way that they are not visible to the human eye in regular light. Above: Photographing vessel interiors can be a real trick. 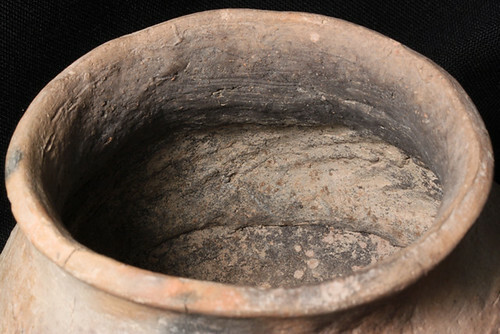 On the interior of this pot, a horizontal coil join and oblique scraping marks can be seen in raking light. For each pot and each photo, I change the light and position of the pot to maximize the visual drama of these features so that the photographs can really tell the story of how the pot was made. However, sometimes small details are overlooked so easily that it is only mid-photo shoot that I suddenly discover their presence when light hits the pot a certain way. It’s truly an optical illusion: now you see it, now you don’t. The photograph is important because it keeps a permanent record of this visual research. 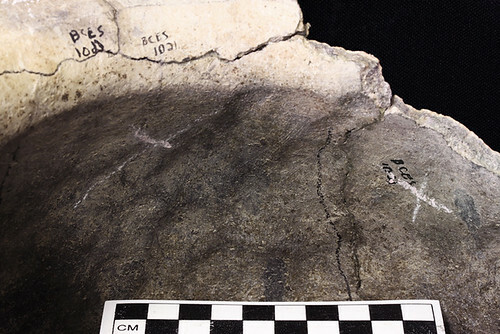 Above: Anvil impressions on the interior surface of this pot show how the pot was beaten with a paddle and anvil. These are details that are hard to see without lighting the interior of the pot properly. About the author: Kelsey Halliday Johnson, is the Ceramics Collection Manager for the Ban Chiang Project. She is graduating with an interdisciplinary M. F. A. (Masters of Fine Arts) from Penn Design pursuing a certificate in Landscape Studies; and an instructor in the Undergraduate Fine Arts Department, teaching Introduction to Photography. Kelsey received her B. A. from Princeton University in Art and Archaeology with a certificate in European Cultural Studies. She has specialized experience managing large, typically visual, databases and would like to continue teaching and working in museums in the future.